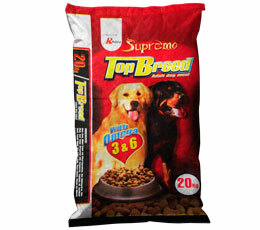 TopBreed Adult Dog Meal was formulated to satisfy the nutritional needs of adult dogs (1 year old and above) for good health, general well-being and optimum performance. The product has a Balanced Energy/Protein Ratio for ideal body weight, Omega 3 and 6 for healthy heart, skin and coat, Calcium for healthy bones and teeth, and Vitamin E and Selenium for strong immune system. 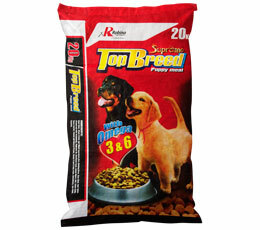 TopBreed Puppy Meal was formulated to satisfy the nutritional needs of puppies (below 1 year old) for good health, general well-being and optimum performance. The product has DHA for normal brain development, Vitamin E and Organic Selenium for strong immune system, Omega 3 and 6 for healthy heart, skin and coat, and Calcium for healthy bones and teeth.